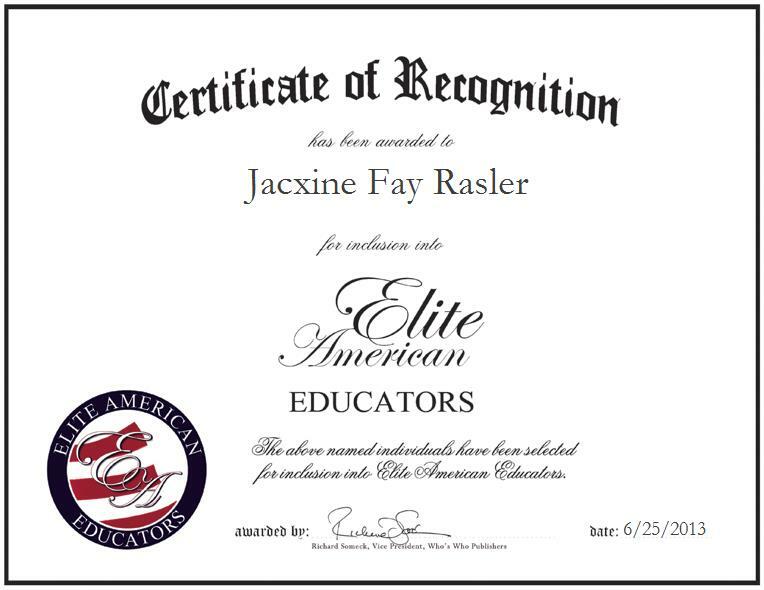 TACOMA, WA, June 25, 2013, Jacxine Fay Rasler, Teacher and Librarian for The Tacoma Public Schools, has been recognized by Elite American Educators for dedication, achievements, and leadership in elementary instruction. For more than two decades, Ms. Rasler has been helping the students with whom she has come into contact to experienced continued academic growth by helping them to excel in area of reading. She currently checks in books that have been lent out, coordinates with teachers on lessons, and deals with AV building techniques and small technical issues of the building. Ms. Rasler was inspired to pursue her current career path by a desire to inspire others academically. Early into her teacher training process, she realized that the part of school that she liked the most was reading. She holds a Bachelor of Arts in Education from the University of Puget Sound, and remains abreast of trends and developments in her field as a member of the Tacoma Education Association and the Washington Education Association.